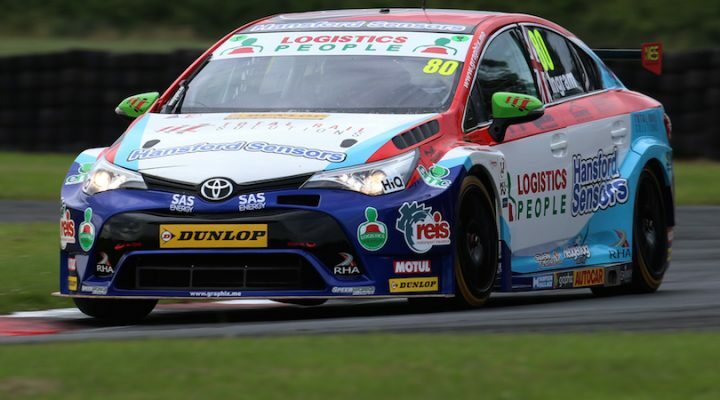 Speedworks Motorsport’s Tom Ingram returned to the top of the timesheets to set the pace in the opening Dunlop MSA British Touring Car Championship free practice session at Croft. The Toyota star is no stranger to P1 but he has endured two relatively low-key weekends at Thruxton and Oulton Park over the last month or so. Ingram has critically collected points during those aforementioned weekends, however, and now it seems he is ready to fight for victories once again. “A positive start to the weekend,” he said. “We know this place does tend to favour rear-wheel drive cars and we fully expect them to come on stronger as the day goes on, but it’s obviously good to start on top and without really pushing. We still have quite a bit more to find from the car here, but the balance of the car feels good with the weight on-board – we’re just lacking performance out of the hairpins. Ingram left it late in this session to pip the all-new Alfa Romeo of Rob Austin, which has shown flashes of speed in its maiden season. Austin suggested his HMS Racing team had made solid progress with the car coming into the Croft weekend, and that has been confirmed with its early showing in practice. Another squad seemingly bouncing back to form is Adrian Flux Subaru Racing as Ash Sutton topped the order for much of the session. The reigning champion had to settle for third at the finish, and was closely followed by team-mate Jason Plato. Driver of the #99 Subaru Levorg sat in the pits for more than half an hour as his team worked frantically on an electrical problem, but as soon as his Levorg was ready to go the BTCC legend clocked some very quick times. Mike Bushell was fifth in the Team HARD-run VW as he impressively saw off the challenge from three former champions, with Matt Neal, Colin Turkington and Andrew Jordan next in the order. The Mercedes duo of Aiden Moffat and Adam Morgan completed the top ten positions. The final practice session will take place at midday before the all-important qualifying session – you can keep up to date with all the action via our LIVE section on the website, which provides live commentary and timing. Qualifying for Round 13 of the 2018 Dunlop MSA British Touring Car Championship will be streamed live on www.itv.com/btcc from 15:15.